Harold “Doc” Daugherty went down swinging in his first major league at-bat. He waited patiently for Detroit Tigers manager Red Rolfe to give him an opportunity for redemption; however, that chance never came. He joined a handful of major leaguers whose careers lasted one fleeting day. Daugherty passed away August 15, 2015 in Downingtown, Pennsylvania. He was 87. Speaking with Daugherty over a half-century after his debut, the memories of his lone plate appearance were still crystal clear. He made the club out of spring training in 1951 after an injury to third baseman and future Hall of Famer George Kell created a need for depth in the infield. An Associated Press report on March 28, 1951 gave Rolfe’s scouting report on the newest member of the Tigers. Kell’s injury turned out to be less severe than expected and with Johnny Lipon firmly entrenched at shortstop; there was little room for Daugherty in the lineup. Right on the day rosters were set to be trimmed, the Tigers recalled knuckleball pitcher Marlin Stewart from Toledo, sending Daugherty to the minor leagues, effectively ending his major league career. A World War II veteran, Daugherty served in the Army after playing football at Ohio State in 1945. 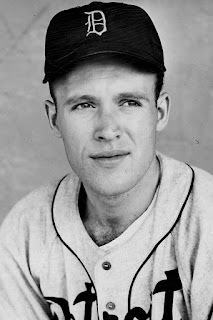 After serving for a year-and-a-half, he signed with the Tigers before the start of the 1948 season. They brought him to major league spring training and the 20-year-old immediately turned heads. Unfortunately, Daugherty never lived up to those lofty expectations, as Rolfe proved to be correct in his assessment of his batting skills. He finished his minor league career in 1953 with a .230 lifetime average. After hanging up his cleats, Daugherty entered the coaching ranks, managing in the Tigers organization, as well as at the high school level in three different sports for over 30 years. His love for athletics was passed down to his children, with his son Mike forming a husband and wife coaching tandem, serving as the associate head women’s basketball coach at Washington State University with his wife June at the helm. Mike, who was an Ohio State alum, played professional basketball overseas.